Sally Hansen has done it again with their newest collection; the Fuzzy Coat! Textured top coats are all the rage these days, and the Sally Hansen Fuzzy Coat Collection does not disappoint! In Australia, Sally Hansen has released seven colours out of the eight that are available in the US - but I was lucky enough to find the eighth shade online! The colour range of this collection is fairly good, although noticeably missing a few colours that I expected of Sally Hansen - such as purple, or yellow even. Fuzzy Fantasy is the colour missing from the Australia collection. I'm unsure as why just one colour was missing, as this is an adorable colour. My favourites in the collection include Wool Knot, Peach Fuzz and Wool Lite. Two layers using normal application. I think this is a really great way to spice up what could be a boring manicure! While in my personal opinion, all of those base colours look great by themselves - sometimes you can get a little bored with them after a few days! I used the normal application and found that while the fuzzy bits are fairly sparse, it creates a gorgeous and different look! I've heard some people have problems with application but I was pleasantly surprised! Two coats each using the dabbing technique. I think that you can get really great coverage using the dabbing technique as you would using glitter. (I actually learnt this technique from watching this beautiful babe's videos! You can check out her YouTube here!) I actually really like these polishes both ways, as either a cute top coat, or a full manicure! The dabbed technique also looks really great as a feature nail! I found that this manicure lasted me ages! (Which is why there are no other manicure photos, I didn't want to take it off!) Chipping was minimal as well, especially considering I didn't use a top coat at all. Overall I'm really loving the Sally Hansen Fuzzy Coat Collection! 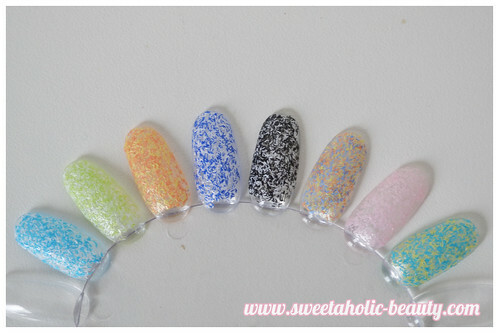 The colours are gorgeous and really pop, and you can make so many different combinations! I ended up buying practically the entire set of them when they first hit the shelves, and I haven't regretted it once! Do you like the look of the Sally Hansen Fuzzy Coat Collection? What's your favourite colour? You can pick these babies up for about $9.95! * Some of these products were provided for my consideration. Was going to pick them up a while ago but was not sure if they were any good. Great review, tempted to buy them now. Gorgeous shades! I really adore this trend! They do look really cute and a lot of fun during summer time! 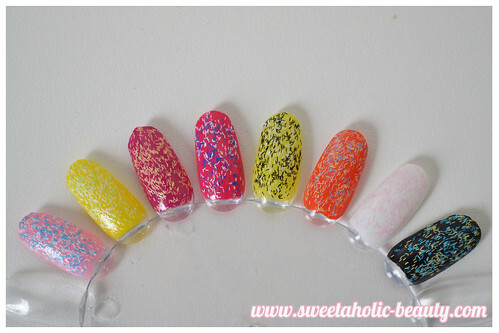 These are so fun, and remind me of ice cream sprinkles! I bought Tweedy a while ago and got so many compliments when I wore it! I picked up Fuzz-sea and I really like it! All the shades are absolutely adorable! I definitely want to pick up some more, namely All Yarned Up. Great review!! I bought Tweedy and used 3 coats over a bare nail for opacity but wasn't crazy about it. I'm now going to try it over a base colour to see if I like it better. Oh wow, these look so effective! You really could come up with soooo many combinations!